There’s something about this new animated feature from the DC Universe Animated Original Movie line that feels like slipping on a familiar pair comfortable shoes. There’s a sense of warmth that comes from it. To see the Justice League back in action, in a great world-hopping thriller, is exhilarating. We get the big ones, too. Batman, Superman, Wonder Woman, Green Lantern, and so on. In addition, we get to see their twisted counterparts from an alternate earth, criminal overlords who use fear to dominate the populace. As you can probably already guess, the Justice League and their evil counterparts collide and, well, as exciting as this movie manages to make that tired concept seem, it gets much better from there. A “good” Lex Luthor arrives from an alternate universe to recruit the Justice League to help save his Earth from the Crime Syndicate, a gang of villainous characters with virtually identical super powers to the Justice League. What ensues is the ultimate battle of good versus evil in a war that threatens both planets and, through a diabolical plan launched by Owlman, puts the balance of all existence in peril. For many, it will be difficult to view this movie without thinking of what could have been. Originally planned as a direct-to-video animated feature to bridge the gap between the classic Justice League and Justice League Unlimited animated series that aired a few years ago on Cartoon Network, Justice League: Crisis on Two Earths is a riveting adventure with the Leaguers facing off against their evil doppelgangers from an alternate reality. Personally, I’m not going to review this feature as “what could have been” but instead “what is.” And just “what is” Justice League: Crisis on Two Earths? Well, likely the most enjoyable direct-to-video animated feature to come out of the “DC Universe Animation Original Movie” line since Wonder Woman. Right away, before I go any further, I need to acknowledge the writing for this feature. Writer Dwayne McDuffie, a familiar name to animation fans thanks to his work on Justice League and Justice League Unlimited, among other series, brings a touch to the dialogue that adds such a flare to the movie. The dialogue here has such smoothness to it, such a casual, comfortable feeling to it. Straight dialogue scenes come off just as engaging as the fisticuffs. Never feeling stilted or stiff, it all plays out rather natural. Sure, some of the expository dialogue can feel a bit clunky, but those instances are few and far in-between. Executive Producer Bruce Timm calls McDuffie one of the best dialogue writers in the business and Justice League: Crisis on Two Earths definitely reminds us of that. I suppose, to continue with a general overview of the film, I have to say I found it incredibly satisfying. The story works on many different levels, there’s a more-than-satisfying conclusion, some nice winks toward the audience, and boatloads of action and satisfying character work. Everything is already established when the film starts, allowing Justice League: Crisis on Two Earths to just dive into the story without having to spend time filling viewers in on characters they likely already know about. And true, it is a pretty straight-forward story, but giving it room to breathe and naturally expand does this feature a world of difference. And, since we have room to breathe, we get plenty of action. And, boy, there’s some brutal action. The Owlman/Wonder Woman plane fight stands out to me as one of my favorites. It’s not the biggest, brutal, most complex sequence, but it’s so wonderfully animated and the voice acting from Woods (“Get off my plane.”) is golden. There’s a fair amount of face smashing, pummeling, and fisticuffs to keep action-lovers engaged. It’s amped up above the usual television standards, resulting more than a few instances of bloodletting from both sides. Again, the fluidity of the Wonder Woman/Owlman fight just really catches my eye. There’s a handful of iffy moments here and there, but those are quickly lost in some genuinely beautiful action choreography. It’s no Green Lantern: First Flight, but it’s still looks sharp. While there’s some heavy, heavy violence, it doesn’t seem gratuitous. Rather, it feels appropriate for the adult tone the creative team is striving for. The story itself can be considered pretty heavy, too, especially Owlman’s ultimate plan. Sure, the film does look pretty colorful, but that helps to deftly balance what’s actually a real weighty tale. We also get some comedic relief, which provides the odd break from some of the more stunningly dark moments we see here. Some moments, especially when Owlman and Superwoman are discussing Owlman’s real agenda, give off a definite sense of unease and general creepiness (with major props the voice talents of James Woods as Owlman). Compared to the previous efforts under this line, Justice League: Crisis Under on Two Earths is definitely darker than what we’ve seen before. As I mentioned in the previous email, James Woods does a spectacular job as Owlman here, bringing a sense of controlled insanity, unhinged but an absolute ingenuity to his character, and will likely be considered a favorite by many here, and with good reason. While Woods did an absolutely phenomenal job as Owlman, I thought the majority of the voice cast turned in strong performances. To lightly touch upon a few here, I found Gina Torres was suitably twisted as Superwoman, Vanessa Marshall really impressed me as Wonder Woman, and Mark Harmon sounded almost identical to George Newbern. And, the biggest surprise to me, was William Baldwin as Batman. Once again, Andrea Romano really, really knows how to cast that role. We saw it with Jeremy Sisto in Justice League: New Frontier and now here with Baldwin as the Dark Knight. Baldwin just pulls it off without a hitch. Even Chris Noth as a very respectable Lex Luthor nails it on every turn. Not once did I find any of the voice work distracting, nor was I ever pulled out of the picture when I recognized the face behind the voice, another strong sign of great casting on Romano’s part. The movie brings a sense of likeability to each of the main Justice Leaguers, even a “love to hate” vibe to the villainous Crime Syndicate. Each has their own quirks, allowing each of them to stand out in the crowd, despite the relative small screen time some of them receive. And, believe me, what will come in handy since viewers are essentially flung into a story that offers little background fill-in. However, based on who this animated feature is geared towards, I doubt that will be an issue. For all the positives found here, there are a couple shortcoming here and there. While the 75 minute running time really allowed for the story to breathe, I found there was some material that felt unnecessary and slow, particularly a subplot with Martian Manhunter. Despite giving him a more human side, Manhunter’s romantic subplot with the President’s daughter felt underdeveloped and superfluous. The absolutely sublime third act makes up for it, though. Once the film rolls toward its endgame, it becomes a tightly-paced, perfectly executed thriller. Additionally, I found there were a handful of moments where the use of CGI, along with some noticeable glitches or jerky movements in the animation, were distracting. There are only a few, that’s true, but some are particularly jarring. There’s one action sequence, where we see the Justice League duke it out with the villainous Crime Syndicate in the clouds, the background seems to change between painted backgrounds, line art, and CGI at random. I can’t help but take pause for a moment, though. Since the crew behind this animated DTV dusted off an old treatment to bring this movie about, I wonder if any other abandoned episode of movie scripts will be resuscitated and given a second life. I can think of quite a few abandoned stories and ideas that would find a suitable second life under the “DC Universe Animated Original Movie” banner. To get this review back on the topic at hand, Justice League: Crisis on Two Earths is a grand adventure for sure, one fans of both the beloved animated series and popular comic series can easily enjoy. Sure, it kind of felt like a three-part Justice League episode, it was still a rollicking’ ride from start to finish. The sublime score is worth noting, as is the nifty directing. The animation was good, though a noticeable step down from the likes of Green Lantern: First Flight, but the story is compelling and the characters engaging. McDuffie hits nearly all the right notes here, and what we’re given is a solid Justice League adventure that fans of the comics or previous animated adventures can enjoy. As you can likely guess, this film easily deserves the Recommended stamp. Go out and give Justice League: Crisis on Two Earths a spin, and I guarantee you will find a wrenching world-hopping adventure. 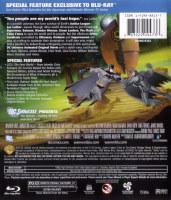 Justice League: Crisis on Two Earths arrives on Blu-ray from Warner Home Video, the disc placed in a standard Blu-ray Elite case which itself is housed in a foil cardboard slipcover. Once again, a nice, shiny package that will help the release stand out on shelves. Diving in, Warner Home Video has provided the main feature with a good, though somewhat lopsided, audio and video presentation. Let’s start with the good – the video transfer. Colors are full and vibrant, the detail is sharp and crystal clear and there is barely a fault to be found. There is some compression and color banding, but those are hardly noticeable. The same can’t be said concerning the audio transfer, which again is a disappointment. The sole audio track is a Dolby Digital 5.1 track. Now, don’t get me wrong, it’s a solid audio track, but where is the TrueHD track? This format is about presenting the best possible audio and video, and we’re lacking one of those here. Like I said, the Dolby Digital 5.1 track is good, but it lacks the full punch of a TrueHD track. For what we do get, it’s a good mix. The mix seems a shade lower than usual, but it does deliver for the most part. Sure, we don’t get the full effect, but the results are still acceptable. Still, if Lionsgate Home Entertainment can give every single one of the Marvel Animated Features Blu-ray releases a full lossless track, on top of other language tracks, then Warner Home Video should be able to as well. Moving to the bonus features on this release, we get a mix of new and repeated content, sadly more repeated content than new. First up is the utterly excellent DC Showcase: The Spectre animated short, the first in an ongoing series of animated shorts slated for inclusion on all forthcoming DC Universe Animated Original Movie home video releases, in addition to other venues. Presented as a creepy 70s supernatural thriller, DC Showcase: The Spectre is a short-but-sweet affair that’s fairly predictable but hard to turn away from. Every little aspect of the animated short – the music, the dialogue, the voice-over, the fonts, all of it – are all used to successfully mimic the era it’s placed in. The short even uses special effects to make the film look ragged and over-exposed. All in all, it’s a solid start to what should be a thrilling line of animated shorts. I’m already looking forward to the next installment. Next up is the “DCU: The New World” featurette, looking at the long-established “Crisis” events that plague the DC universe. Starting with “Crisis on Infinite Earths” and running to “Final Crisis,” this featurette looks at the ever-changing landscape of the universe and how these monstrous events affected those characters. Creators old and new, including Paul Levitz and Geoff Johns among others, share their two cents on these comic stories and the real-life events that shaped them. All in all, it’s really interesting, with some of the more compelling discussion coming from Dan DiDio’s memory of the events of September 11th and how that eventually played in a role in DC’s current landscape. The last of the new content is the “A First Look at Batman: Under the Red Hood” featurette, which has definitely caught my interest. The featurette takes a quick look at two popular Batman storylines that serve as inspiration for this flick and provide a nice helping of behind-the-scenes details. It’s your standard fluff piece, yes, but there’s plenty of artwork and production content to look at. Sure, the featurette makes no real attempt to hide the mystery behind the film’s antagonist, but I doubt that will deter anyone’s interest. The rest of the content here is made up of four episodes from the Justice League animated series, the first episode of the 1970s Wonder Woman series, the abandoned Aquaman: Mercy Reef pilot, and a collection of “First Look” featurettes for previous releases under the DC Universe Animated Original Movie line. That adds up to over three more hours, roughly, of content, though the majority of which is repeated from previous home video releases. Still, outside of the “First Look” featurettes, they are worth checking out once again. Now, I’m of two minds with the bonus features for this release. On the one hand, I really enjoyed the”DCU: The New World” featurette, especially as a long-time comic book reader. It serves as a nice look into the world of DC Comics that is both entertaining to those who are long-time readers, like myself, or those interested in checking out the four-color adventures of DC’s best. Sure, the featurette could have actually delved a bit further into what these events were actually about, deeper than the broad comments made about each, but there should be enough there to whet anyone’s appetite. The inclusion of animated shorts under the “DC Showcase” banner is also a great addition to the bonus content for these releases. It’s a great idea on Warner Home Video’s part, and I hope these remain a permanent fixture on these releases for years to come. And, like all fans, getting a look at the next animated feature is always a major plus. However, I feel that there’s not enough bonus content directed toward the main feature. Why isn’t there a new featurette for the main feature? Maybe a look at the voice cast? What about deleted scenes or outtakes? More thoughts from the cast and crew, perhaps? Given the rather colorful history of Justice League: Crisis on Two Earths, there is plenty of meat here for a solid featurette or even a commentary. I just cannot help but feel a little let down that we do not get to see a look at the production behind this animated feature. Hopefully we’ll see this change in future releases. Overall, for those looking to pick up the best possible release for Justice League: Crisis on Two Earths, go for the Blu-ray. Even if the bonus features aren’t as satisfying as they should be, you still get a wealth of content worth checking out, specifically the new DC Showcase: The Spectre short and the interesting “DCU: The New World” featurette. And, hey, the movie itself looks gorgeous in Blu-ray. Once again Warner Home Video has just knocked it out of the park with the video transfer here, looking absolutely gorgeous. While the audio is, once again, disappointing, this release still represents the best presentation of Justice League: Crisis on Two Earths available and that in itself warrants the Highly Recommend stamp. We just need to start seeing more bonus content focused on the actual movie itself. Thankfully, the main feature is easily worth the price of (high-definition) admission alone. Justice League: Crisis on Two Earths will be available to own on Blu-ray, Two-Disc Special Edition and single-disc DVD on February 23rd, 2010. 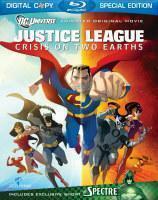 More details on Justice League: Crisis on Two Earths are available at The World’s Finest.